I went to bed last night after attending the Grand Opening of Red Bull Arena, thankful that I was going to sleep, and not just about to wake up from a dream. Yesterday was like getting a visit from Santa Claus, Hanukkah Harry, the Tooth Fairy, the Easter Bunny, and Lindsey Vonn, all at the same time. It was one of the best sports-fan experiences I'll ever expect to have, and a genuinely great day all-around. 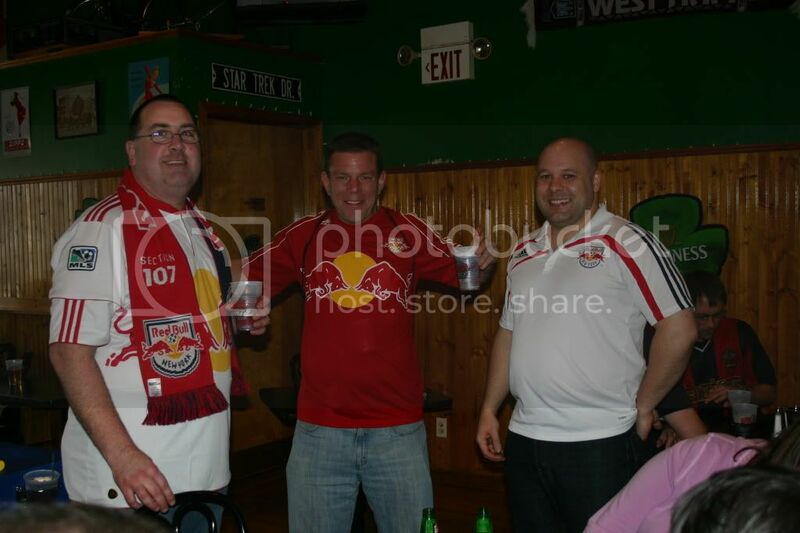 When the Red Bulls used to play in the Cavern-Which-Shall-Not-Be-Named (CWSNBN), I was not a "game-day experience" kind of fan. Working in the entertainment business as I do, I often had to work on Saturdays, leaving me with no time to join the tailgating crowd. I drove to the CWSNBN, parked, entered, dealt with the general gloom of the environment and the employees, watched the match, got in my car, and drove away. I am, and forever more shall be, a Total Game Day Experience fan. Taking public transportation seemed like it would add too much time to my day, and cost too much. From some early reports about traffic, as well as my own observations, I'm not sure driving would have bought me any time, but I'm sure it would have cost me all of my patience. As far as the additional cost, it was easily more than made up for by paying $3 or $4 per beer at MMM Bello's, greatly diminishing my need for $6 or $9 beers in the stadium. Around 4:30 or so, a few of us decided to head out a little early--we wanted some time inside the Arena to check it out and take it in. We headed to the nearest trolley stop, where a few fans waited. A helpful Red Bull employee was there to answer questions, and provided the honest advice that walking, or the two-minute PATH ride from Newark to Harrison, would be good alternatives to the trolley. The trolley is a great idea, but they were not immune to the traffic jam that crippled the area. So, my wife and I decided to walk. Walking was the perfect choice. First of all, yesterday was undeniably the nicest day of the spring so far. Second, we walked past three trolleys and left them sight unseen. Plus, there was the sense of community as we walked and joined more and more fans all making the pilgrimage to our new Mecca. There were long lines at Gate A, so we walked around to the east side and entered at Gate D, happily also the gate closest to our seats. There were more gate employees waiting for fans than there were fans. We had a brief problem getting in--my wife swiped her season ticket card and the turnstile got bumped, revolved (and thus, relocked) before she actually walked through. There was a customer service rep who immediately came over, reset her card, and voila! problem solved. 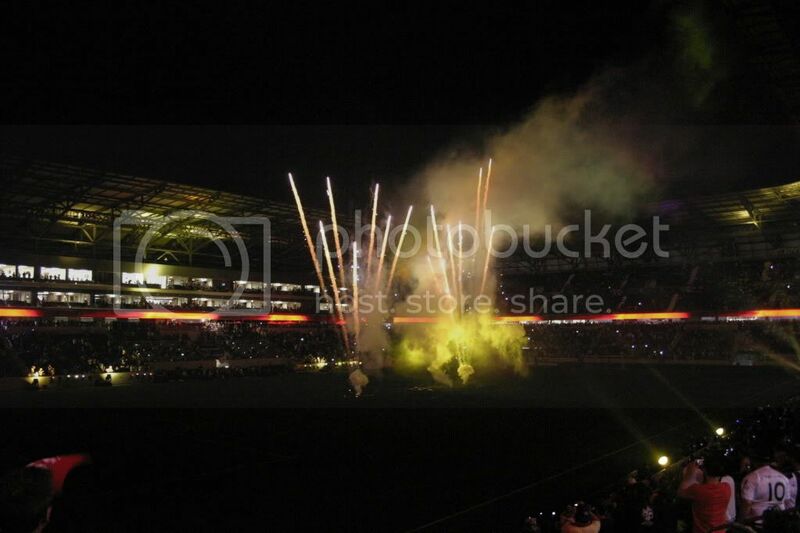 The last time I was there, to select my season ticket location, the pitch was a dirt mound and there were no seats. But, there it was in front of me--no... all around me... The natural grass pitch. The soccer lines. The steepness of the seating bowl bringing every seat as close to the pitch as possible. The 360-degree seating. The wrap-over roof. Everything there to envelop the fan into the experience. It worked. I'm hooked. By now, there are game reports everywhere. I'll skip that as I'm already running long. 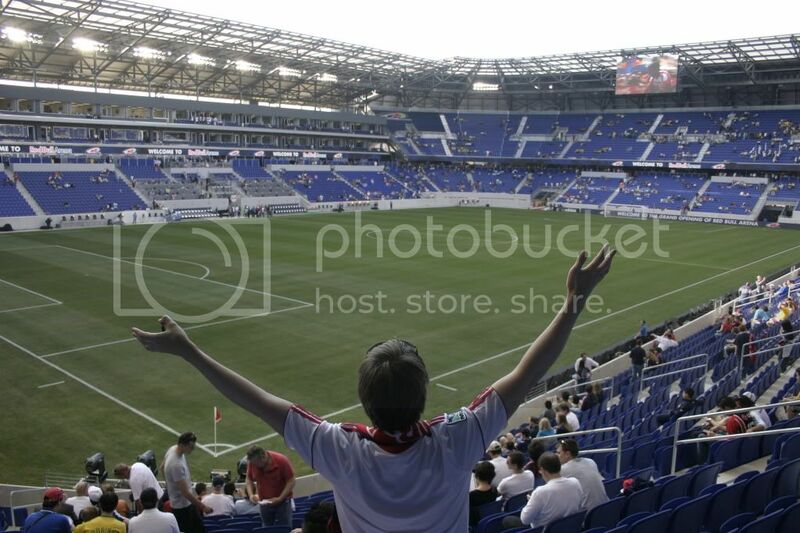 I do want to provide some quick observations about the experience of watching a game at Red Bull Arena and a few quick thoughts about the team, though. Security was friendly and helpful. When we left, they stood at the gate with big smiles and wished everyone a good night and safe travels. Seriously. There were absolutely no vendors roaming the stands. THANK YOU! No one walking by to block the view and distract attention from the pitch. No having to pass someone's hot dogs, relish packets, and cash down the row while I'm trying to watch the match. I realize that there were some long lines at the concession stands yesterday, but PLEASE RBA: NEVER have vendors roaming the stands. This was the first time I've attended a sporting match without them before, and never realized how much I hate them. An excellent decision that should be carved in stone! Crowd noise was rocking! 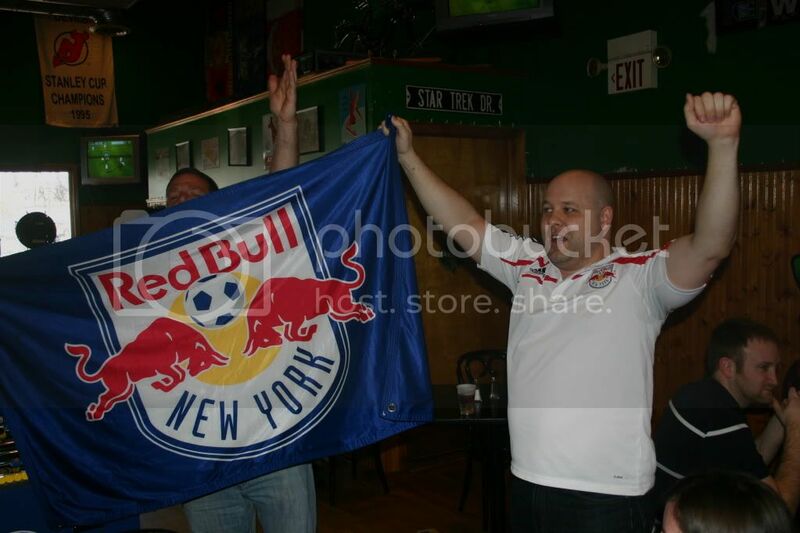 The Supporters' Clubs never stopped from the moment their drums and chants announced their arrival. Occasionally, the stomping from the aluminum upper deck sounded like an earthquake. The team looks good. I mean, they really look good. They keep their defensive shape and are communicating in the back, being led by Mike Petke. They have tactics. They triangulate. They know what to do when they have the ball, and what to do when they are off-the-ball. They push forward with confidence. They overlap their runs. The off-season free-agent pickups are all contributing, and every draft pick has been signed. Ibrahim Salou looked good last night--he made it very difficult for defenders to get the ball off his feet. This could lead to an interesting roster decision. If my calculations about our roster are correct, we have only one spot remaining on the team, with both Juan Agudelo and Salou yet to sign. If we add them both, someone is on their way out, as early word on the new CBA has roster limits staying the same. 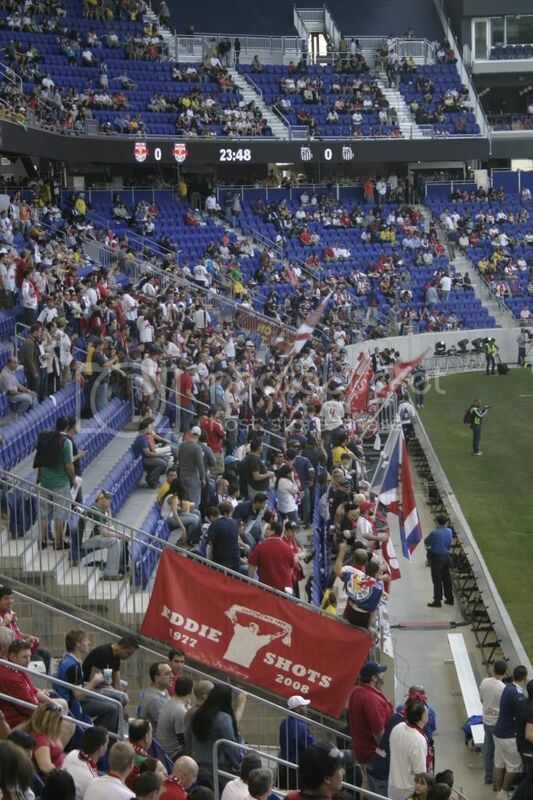 ENTER RED BULL ARENA AT YOUR OWN RISK, because once you have gone for the first time, you will be unable to focus on anything else except when you will be able to return.